But I hope the Chairman has deep pockets if he plans on buying more than a bottle of Rogue's Morimoto Imperial Pilsner. Sure, it comes in a pretty ceramic 25.4 oz. bottle, but does that make it worth...$17.99?? My problem with it (as with many Rouge varities)is the packaging overprices the beer. That is a shame, because a lot of people will be missing out on a great version of the Imperial Pilsner style due to the inflated price, and the bottles will collect dust on the shelves. 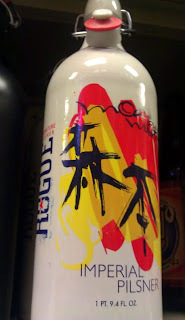 I can barely afford a can of Wolfgang Puck soup, and this Morimoto Imperial Pilsner equates to a $50+ six-pack. Maybe I can borrow some money from Alton Brown. Finally, prices that are a little more down to Earth with a new release from Sierra Blanca Brewing. 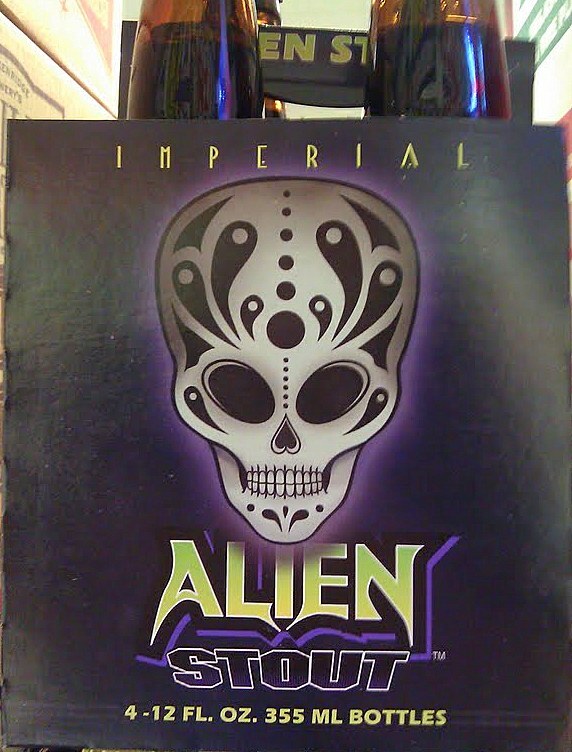 Their previously draft-only Imperial Stout (which is always on tap at ABQ Brew Pub)is now available in four-packs and is dubbed Alien Imperial Stout, no doubt playing upon the successful name recognition of the Alien Amber and Wheat beers. It is a very approachable version of the style, at 7.2% ABV and a modest IBU level. The price is modest too, at $7.99 per four-pack. 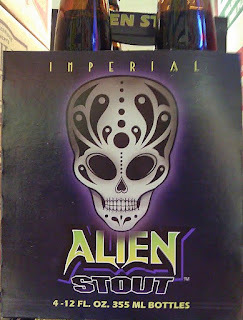 You can find both the Alien and the Rogue beers at Kelly Liquors and Jubilation.